I would never dream of either referring to or addressing the highly regarded Mr. Foote by his given name unless invited to do, and since I am unable to speak to ghosts – Mr. Foote it shall be. 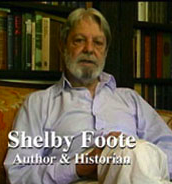 (However, in the interest of clarity: I refer to none other than prolific author and distinguished gentleman, Mr. Shelby Foote.) I am convinced that Mr. Foote must have been the among the finest of Confederate Generals in a past life to have effused such depth and breadth of understanding of such intimate knowledge in this one, therefore, he is my favorite Civil War “persona”. I could spend hours listening to him describe anything as mundane as paint drying, and if you could too – you will find more than 4 exquisite HOURS of Mr. Foote discussing more enthralling topics via the advanced search page on c-spanvideo.org.